The events in Hong Kong have seen technology play a huge role in organising political protest, as much as in the days of the Arab Spring of 2011. But governments have become wise to the potential influence of Twitter, Facebook and Instagram, and blocking websites is easy (if you’re the government). The technology now wielded by the students and protesters in Hong Kong has evolved. The Firechat app isn’t connected to a centralised service or website through which its messages are routed. Instead, each phone running the Firechat app acts as a node in a mesh network, passing messages node to node, from origin to destination. In this way, the messages cannot easily be blocked. This is quite different to the way mobile phone networks function. The by-and-large excellent coverage we enjoy is possible because the network providers – such as Orange, Vodafone, T-Mobile, EE and Three in the UK – have spent many millions setting up base stations across the globe. Although the protocols differ between networks and have evolved over time (GSM, EDGE, 3G, 4G) they all work in a similar way: the base station forwards traffic from the phone, towards the intended destination. This does mean, however, that base station failures can severely disrupt communications. Ad-hoc mesh networks such as Firechat uses take an alternative approach. Instead of routing traffic through base stations, they allow nearby mobile phones to communicate directly with each other – what is called peer-to-peer networking. This model has many benefits, including lower costs and higher performance. They have found a variety of purposes over recent years, largely in bringing low-cost internet connectivity to areas that are not well provided for – whether in Africa or western Scotland, or northern England. They are also used to deploy free, community wireless networks in cities, popular in Germany, and also available in Bristol. The key property of mesh networking is its resilience: with no reliance on base stations, ad-hoc mesh networks can stay up and functional even when some or many nodes are off. This makes them difficult to shut down in an easy, kill-switch fashion. This has made it of interest to the military and also to disaster response agencies. Instead of attacking the base stations used by standard mobile networks, it would probably be necessary to use some sort of jamming signal, broadcasting powerful radio signals to disrupt the mesh network over specific geographic areas. If you want a live demonstration, try this: put your wireless internet-connected phone next to the microwave and turn it on. Wi-Fi uses the same radio spectrum as a microwave, and 850W of nearby microwave interference will be enough to damage your phone’s chance of communicating clearly with your home base station. 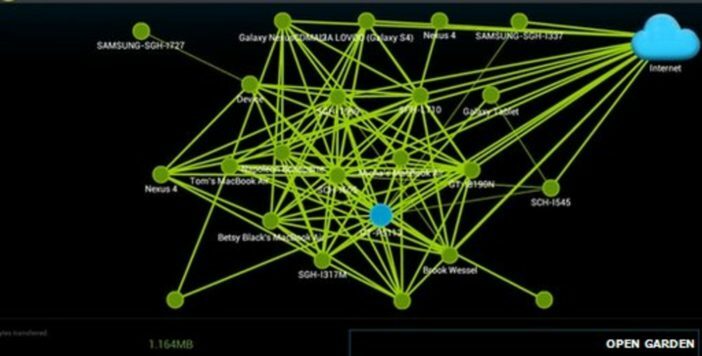 Firechat uses these aspects of mesh networking to its advantage and the protesters have used Firechat to theirs. It’s also found strong followings in Taiwan, Iraq, Syria and Egypt. The app has been downloaded 4m times from one Chinese app store alone (Tencent). Firechat allows three different types of messaging. The Everyone mode is like talking in an open chat room, where a limited number of people can interact based only on their proximity to each other. The Nearby mode allows users to find others close by. The Firechat mode is a chat room based on a single topic. While popular, no approach is perfect and FireChat has already had several issues identified. For example, the highly open nature of communications, with nearby users all part of the same “conversation”, brings with it problems of privacy and anonymity. There is no encryption or user authentication – and while this makes it easy to set up and use, it means all communication is open to eavesdropping, or raises problems of users masquerading as people they’re not. Firechat’s developers have even openly said that it is not a tool for communicating sensitive information. As with everything, the devil is therefore in the detail and users should be aware of its limitations. Nevertheless, it is an important development towards ensuring that the power and reach of the internet is democratised and cannot be switched off by the powerful at the expense of the people. Gareth Tyson does not work for, consult to, own shares in or receive funding from any company or organisation that would benefit from this article, and has no relevant affiliations.